Visual Workflow allows us to automate business processes by building applications, known as Flows. 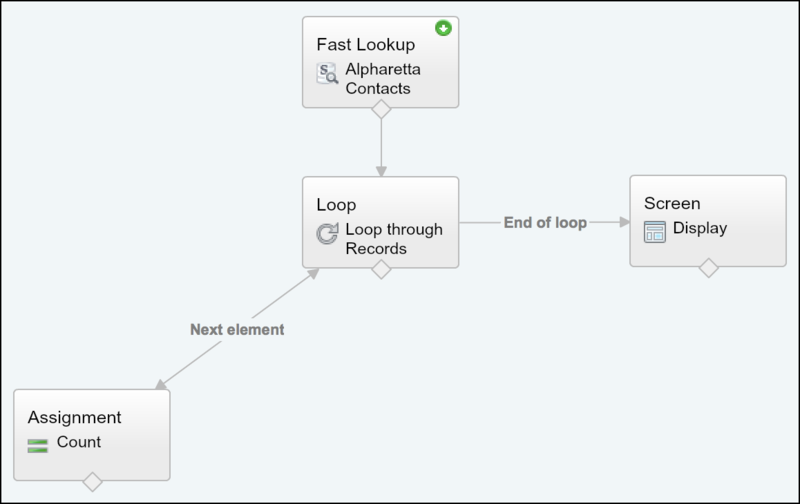 Using Flows, a user can collect information; or, they can update, edit, or create records in Salesforce. Furthermore, Flows can execute logic, interact with the Salesforce database, call Apex classes, Platform Events, and guide users through various screens to streamline the process of collecting and updating data. Once a Flow is built, an Admin can make the Flow available to the right users or systems. Now suppose you wonder, can I achieve the aforementioned outcome by using Flow? Well, you are in luck! For, before Summer’18 release, it was very complex to count the SObject Collection variable (Kind of equivalent to Apex list). But, since Spring’18 release, a user can use Assignment element to count the SObject Collection Variable size and store that number in a variable without using the Loop element! Edward Backhouse is working as System administrator at GurukulOnCloud. He received a requirement to count Contact records where Mailing city equals Alpharetta. The new feature of Flow to rescue! There are few possible solutions for the above business scenario. One of them, of course, is to continue to use the old method, as shown in the preceding screenshot. Edward navigates to Setup (Gear Icon) | Setup | Process Automation | Flows in Lightning Experience. Then he clicks on the New Flow button – which, in turn, opens the Flow canvas. 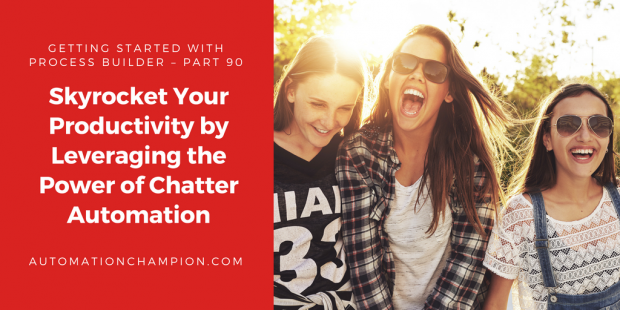 Chatter Group is one of the best ways to boost collaboration in your organization. A Chatter group represents a group of users – one can add unlimited members to a Chatter Group but, a user can join a maximum of 300 groups; and, your company can have a total of 30,000 groups. Chatter groups can be public, private, unlisted, or archived. In the aforementioned article, I have discussed few advanced concepts that will help you to automate Chatter Group membership. If you didn’t get a chance to read it yet, do it now! It will significantly improve your knowledge of Process Builder and automation around Chatter. Below are few tasks, related to Chatter groups, that can be automated to enhance productivity. Criteria based auto-archiving – Archive this group if there are no posts or comments for 90 days. Send email notification to group owner or managers when Chatter group doesn’t have a description. Until now, it was necessary to write Apex code to manage the aforementioned tasks. Since Spring’18 release, however, it is now possible to manage these tasks with the help of Flow and Process Builder. Let us see how to get started on working smarter by tackling a business use case. Whenever a Chatter Group is created, automatically add system administrators to the group. Yes, yes, I know! Adding System Administrators to a new Chatter Group is just one of the Chatter automations listed above! But, what fun is it in being spoon feed? Why not harness your newly acquired knowledge – of Process Builder and Flow – and try your hands on the other aforementioned scenarios? What do you have to lose by accepting the challenge? Why worry when you know that I am just a click away? If, despite trying, you find yourself getting stuck then, just drop me a line! Go ahead, master the material by flying solo on the other scenarios! Ok, now let us get back to creating a solution for the problem at hand – whenever a Chatter Group is created, automatically add system administrators to the group. There are a few possible solutions for the above business scenario, but we’ll use Flow and Process Builder to solve the above business requirement. Before trying to understand the technical aspect of the solution, let us spend some time to understand the general flow at a high level. Please spend few minutes to go through the following flow diagram and understand it. Before we proceed further, let us understand the characteristics of CollaborationGroupMember – It represents a member of a Chatter group. Read the rest of this entry!